Padding Add On. Add Padding to Any Jayblue Top. Swimsuit Padding. Add a thin layer of padding to any Jayblue top for more support and definition. Each pad is directly sewn onto the cups on a top of your choosing. If you will be purchasing multiple tops please specify which top you would like the padding added to in the notes to seller! Choose the size that corresponds. *** Please note that tops with peepholes in the cups such as the Risa and Lacy styles will either require smaller pads or will have the white showing through. Let me know your preference! Jayblue Classic Elongated Crop Top. Hand Crocheted Bohemian Cotton Top. Vegan Friendly Festival Wear Crochet Top. More Colors! Risa Crop Top. Hand Crocheted Bohemian Festival Top. Vegan Friendly Cotton Crochet. More Colors! Gypsy Sol Wrap Around Halter. Hand Crocheted Vegan Friendly Cotton. Bohemian Festival Crop Top. More Colors! Gypsy Halter. Bohemian Festival Crop Top. Hand Crocheted Vegan Friendly Cotton. More Colors! Jayblue Classic Crop Top. Hand Crocheted Bohemian Cotton Top. Vegan Friendly Festival Wear Crochet Top. More Colors! Risa Gypsy Wrap Around Halter. Hand Crocheted Vegan Friendly Cotton Crop Top. Boho Festival Crochet Top. More Colors! Maisa Bikini Bralette. Hand Crocheted Bohemian Festival Bikini Top. Boho Crochet Top. Vegan Friendly Cotton. More Colors! Kailua Endless Summer Cowrie Shell Halter. Hand Crocheted Tropical Crop Top. Vegan Friendly Cotton. Bohemian Festival Wear. More Colors! Stella String Bikini Top. Hand Crocheted Bohemian Swimwear. 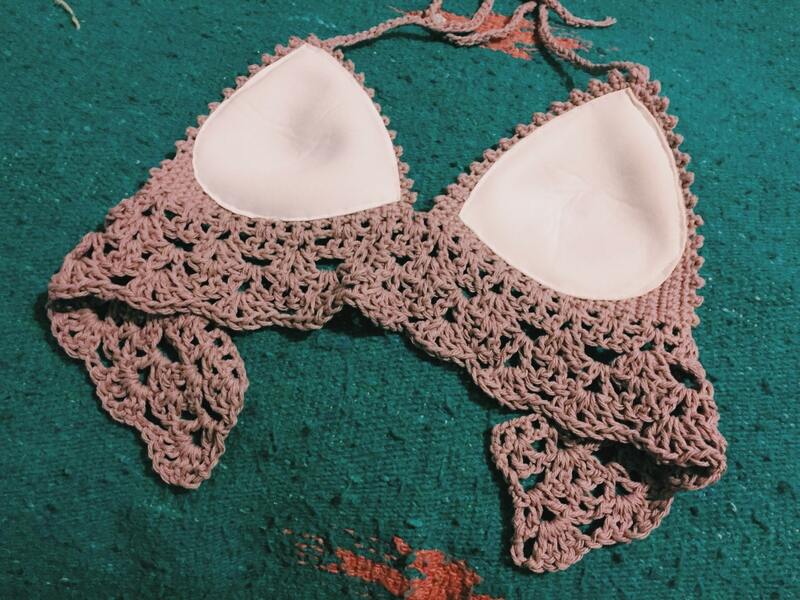 Vegan Friendly Cotton Crochet Bralette. More Colors! Stella String Bikini Brazilian Bottoms. Hand Crocheted Bohemian Swimwear. Vegan Friendly Cotton Crochet Bottoms. More Colors! Exactly what I wanted, great service and I love the product!! Thank you so much!! Hand Crocheted Classic Skull Headband. Vegan Friendly Sugar Skull Headband. Halloween. More Colors! Hand Crocheted Classic Skull Scarf. Vegan Friendly Sugar Skull Scarf. Halloween. More Colors! Production will begin on your order in the order it is received so long as your payment has been cleared. If for some reason a cancelation must be made, please contact me immediately. If you are unsatisfied with your purchase please contact me, if you would like to send the item back I will refund you the cost of the item minus shipping once I receive the item. Custom orders will be non refundable. Please make sure your return is in new/unworn condition. All items are made to order and shipped within 1-7 business days (sometimes sooner or sometimes longer depending on size and intricacy of the item, as well as order volume) check with me to receive up to date processing times! All shipping is calculated, however if for some reason their are overages they will be refunded! Packaging is kept simple and I ship via first class mail so domestic orders will take 2-5 business days to arrive after shipment, tracking numbers will always be provided for all orders! International parcels may take up to 2 weeks after shipment to arrive, sometimes sooner or longer depending on where you are located. Faster shipment upgrades are available at check out! ****International customers please be aware that some countries do charge an extra tax upon pick up of your item, this mainly applies to much of Europe, so if you are not sure please look into your country's international shipment regulations, and know that their might be an extra fee at your post office. Gypsy Classic High Neck Halter Top. 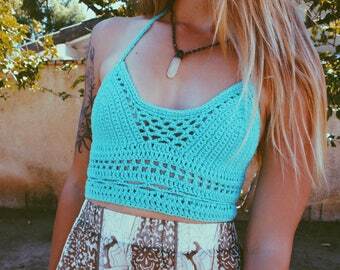 Hand Crocheted Boho Festival Backless Crop Top. Vegan Friendly Cotton. More Colors! Maisa Brazilian Bikini Bottoms. Hand Crocheted Vegan Friendly Cotton. Bohemian Gypsy Swimwear. More Colors! Cali Bikini Bralette. 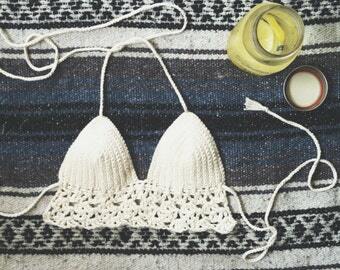 Hand Crocheted Bohemian Bikini Top. Vegan Friendly Cotton Swimwear. More Colors! Lacy Bikini Bralette. 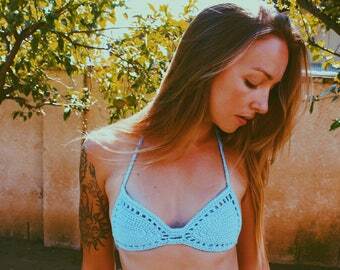 Hand Crocheted Vegan Friendly Cotton Bikini Top. Bohemian Swimwear. More Colors! Stevie Beach Cover-Up Shorties. Hand Crocheted Vegan Friendly Cotton. Bohemian Beachwear. Cheeky! More Colors. Beachy Pastel Stevie Beach Cover-Up Shorties. Hand Crocheted Vegan Friendly Cotton Bohemian Beachwear. Cheeky! More Colors.